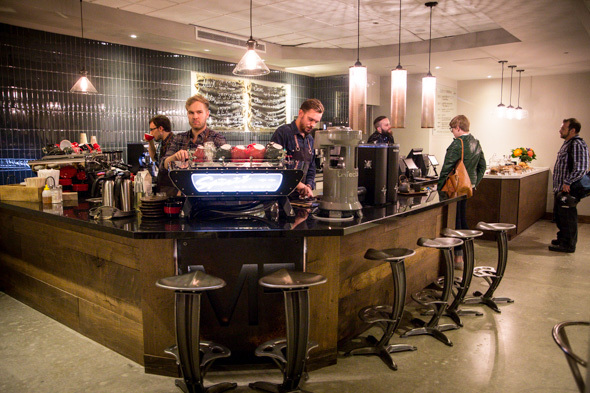 M Square Coffee is the latest independent coffee shop to bring a caffeine jolt to the Financial District . 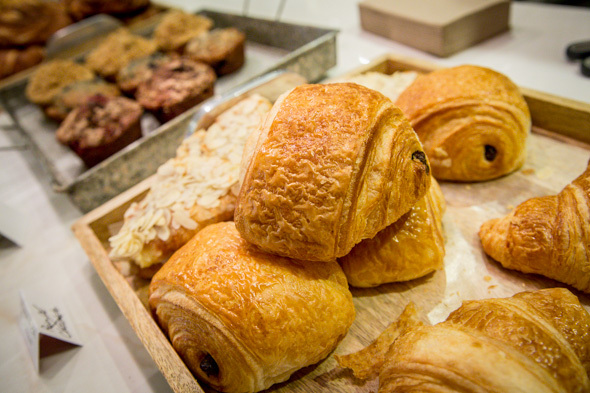 Tucked under the Sheraton Centre, the cafe brings some carefully-chosen coffee and baked snacks, top-shelf equipment, and a friendly, neighbourhood-style vibe to an admittedly otherwise-drab stretch of the PATH. 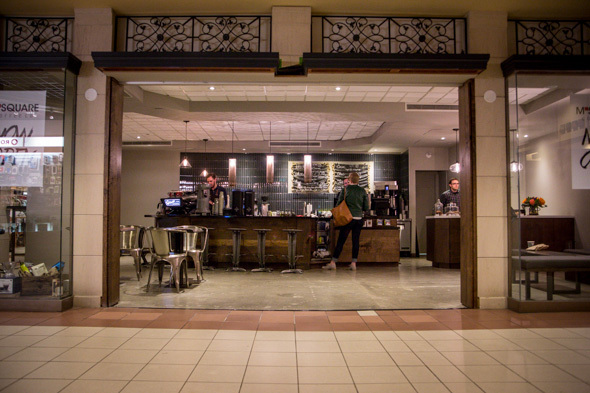 The cafe, located in a former jewelry store, is the pet project of Maribel and Mario Morataya (hence the "M Square"), who wanted to bring an indie cafe to Toronto's favourite Habitrail for urban professionals. Coffee fans will be similarly psyched about the new arrival. Sitting on the low-down counter (which come with bar stools - perfect for friendly face-to-face chats with your barista) are two gleaming Kees van der Westen "Spirit" espresso machines - apparently the only ones in Ontario. Their fleet of grinders, meanwhile, have heated burrs, which helps ensure a reliably even grind throughout the day. The beans take a similar specialty approach: Vaandering estimates he and the staff must have tried 50 different blends from North America, Sweden and Australia. ("It was like, coffee highs for days. It was awesome.") The end result of all that research: The shop uses Phil & Sebastian beans from Calgary for milk-based drinks, and Bows & Arrows from B.C. 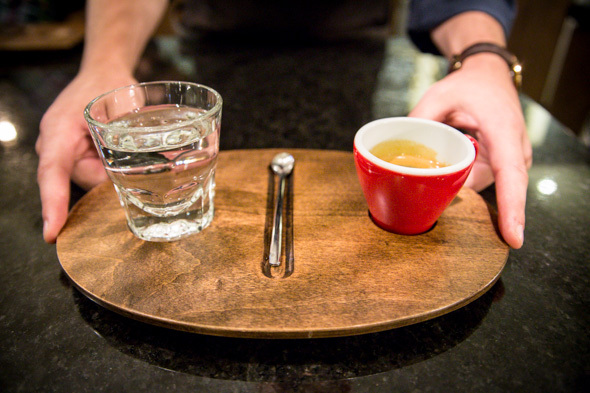 for straight-up espresso. Also on the menu: single-producer teas and hot chocolate made with melted Valrhona chocolate (and powdered guajillo chili pepper, if you're feeling adventurous). Their chai lattes are made with honey-packed chai tea, which Vaandering and manager Justin Carriere discovered while living in Australia. 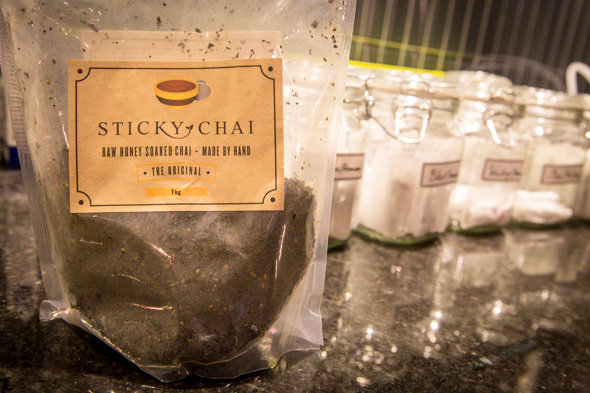 "They take chai tea and soak it in honey - it comes to us that way." The end result comes in big vacuum-sealed bags, has a texture reminiscent of damp granola - and makes a killer latte ($4.25). The search was no less intense for their baked goods - the shop is now cherry-picking their cookies from Bunner's Bake Shop and muffins from Flagship, the offshoot bakery of Capital Espresso in Parkdale. I'm pretty much helpless before the lure of Flagship's raspberry Nutella muffins, which come swirled through with chocolate and tangy, almost-sour raspberry (and aren't nearly as cloyingly sweet as they sound). If you're looking for something heartier, grab a ham wheel. 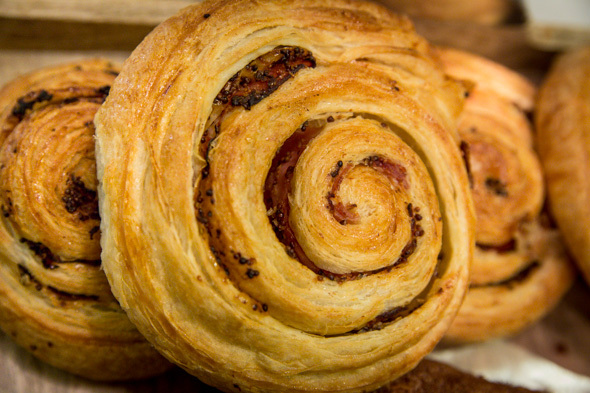 The croissant-dough spirals make a perfect breakfast on the go - the pastry is streaked with grainy mustard and studded with crispy bits of ham, with another slice hiding out in the middle. Next up, they're hoping to add jam plates from Kitten and the Bear (with Blackbird Baking Co. bread), and some parfaits made out of water buffalo yogurt. Yep, we're officially way past shopping mall food court territory here. Still, they're not going too far out of their way to set themselves apart from the rest of the PATH. 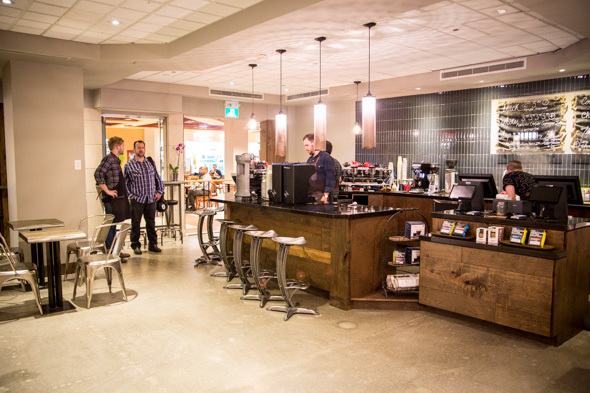 In fact, it's all part of their strategy - the bar seating at the outer corner of the cafe is open to the outside, fostering conversations between those enjoying a coffee and those passing by. A week after opening day, area workers are starting to wise up to the cafe's existence - even if it takes a little prodding. "We just started handing out free coffees to people," Vaandering says. "People in the PATH, they just walk, head down, going where they're going. A lady, one time, was like 'Where's this from? Why are you handing out coffee?' I'm like 'We just opened that cafe right there.' They just didn't even realize it. A lot of it is getting out there and letting people know that we're actually here." You heard the man, PATH commuters - wake up and smell the coffee.